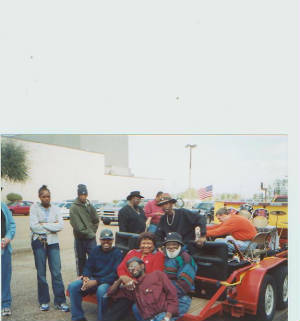 On this home page we'll introduce our creator, Bobbie Oliver and the band family. We will have a few photo's of each member. The band members are Lady G, our female vocalist, she's HOT* HOT*HOT. Oran Gipson on bass, he's sooo cool and talented playing multiple instruments. 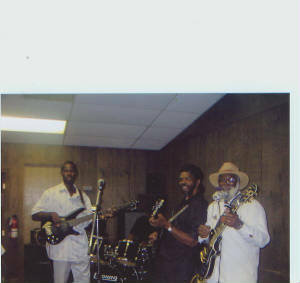 Booker T. Carpenter on drums, he can beat anything and he's badd to the bone.We cannot overlook our lead guitarist, Val Laughlin who went home on May 17,2006. Val is a permanant member of the band and will always hold a special spot in our hearts, In the mean time we have Bobbie Mercy Oliver on lead guitar . 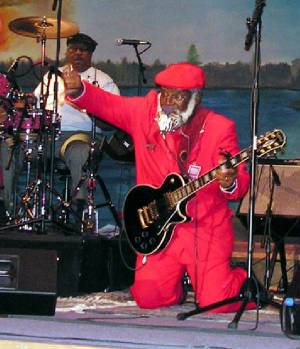 Top photo, Bobbie Mercy Oliver turning on the gas at the first annual T-Bone Walker Blues Fest in Linden, Texas, June 17, 2006. We are excited that you are visiting our web site. Our band is here to provide unique blues and old school music for all genres. You are our honored guest and we heartily invite you to view our web site which is always under construction, another one of our manager/promoters duties. On this site you'll find information about our activities and CD'S, along with descriptions of our special talents which the Lord have blessed us with, the ability to sing, play instruments and entertain in very special ways. We don't mean to toot our own horns, the truth speaks for itself. If by chance you have not seen or heard us, you need to, because you are missing a treat. Bobbie Mercy Oliver is a one man band by himself, playing his pretty black guitar and sucking or blowing his many harmonicas ala Jimmy Reed, Little Walter, Slim Harpo and many other great legends style. Lady G can belt out tunes by Aretha Franklin and many other great performers, not to mention her own tunes. Oran Gipson can let his fingers do the walking on his bass guitar, and extraordinaire on lead guitar. Booker T. Carpenter is our drummer and our most valued, simply because we have needed a real good drummer for many moons. When we tell you the man is badd to the bones, you can take that to the bank and deposit it in any account. 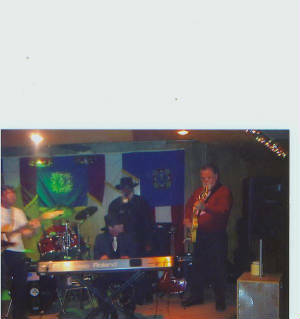 Val is our most loved guitarist, His spirit has become a permanent fixture with a lifetime guarantee. He was extremely talented and the women just loved him to pieces. 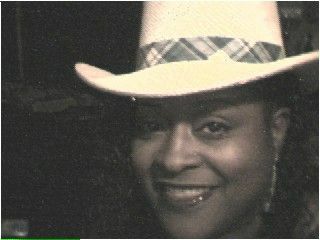 We must give all thanks to God and our manager/promoter turned web designer, Eva Oliver. You can listen to all nine clips off our latest CD'S, Mississippi Mudd and Simply Bobbie released in may 2006 on the web site BuyMusicDirect.Com.